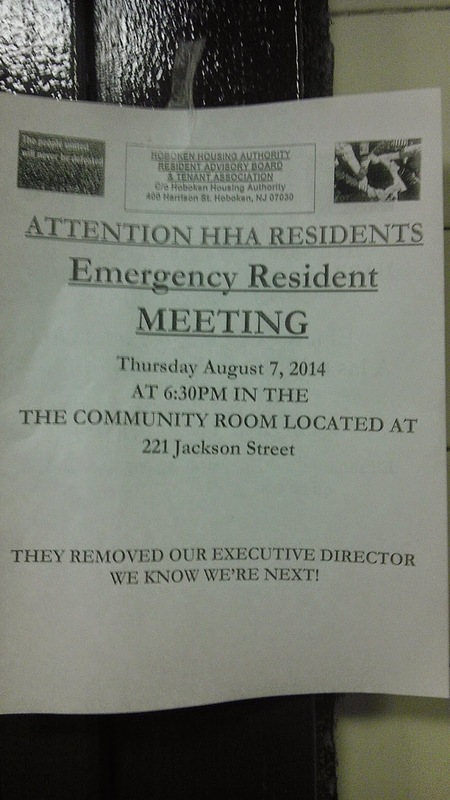 A flyer appearing apparently without the required HHA administration's approval has appeared stating there's an emergency meeting scheduled for 6:30 at 221 Jackson St. The flyer also claims, "THEY REMOVED OUR EXECUTIVE DIRECTOR WE KNOW WE'RE NEXT! Barbara Reyes, a staunch backer of Carmelo Garcia and thrice rejected HHA board candidate may be the person who is hosting the tenant meeting. Confirmation will follow this story. A report from a reliable source says there is rumor mongering going on telling residents they will all be evicted. The source insists there is direct linkage to this flyer. This flyer is not likely authorized by the HHA office and its new interim director. What happened when other HHA residents previously attempted to post flyers? As MSV readers will readily recall, they were threatened with eviction and requested to sign their own eviction notice. In some parts of Hoboken, this is called caring. The word we have in mind is not one likely to be published here. Talking Ed Note: Talk amongst yourselves. Now comes the ugly sewer laden backlash. Lies will be propagated and fear will be sold to any HHA resident willing to listen. The new interim HHA director should act quickly to stop the fear mongering.